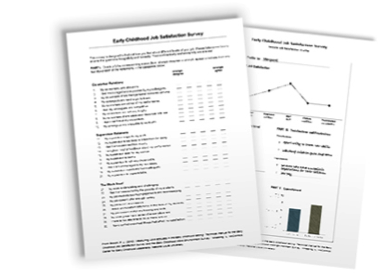 The Early Childhood Job Satisfaction Survey (ECJSS) is a career guidance and goal-setting tool for early childhood practitioners seeking greater insight into the factors that support job fulfillment. The ECJSS assesses a person’s level of job satisfaction in five areas. 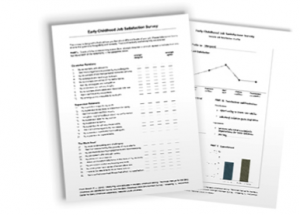 Individuals completing the survey are responsible for scoring their assessment and developing their own personal profile. The profile may then be brought to a goal-setting meeting with their supervisor and used as a springboard for discussing different aspects of their job. To read a description of the five facets of job satisfaction assessed in the ECJSS, click here. Download your complimentary copy of ECJSS [Click here]. Complete the survey and score it using the scoring directions included with the survey. The individual completing the ECJSS should determine the degree of disclosure they feel comfortable with when sharing their profile with their mentor or supervisor. Click here to download questions a supervisor or mentor can use to help structure the conversation. Individuals interested in using the ECJSS as part of research on early childhood workforce issues are encouraged to contact New Horizons for technical support as needed.